With only a few hours left before the Brexit deadline and with the United Kingdom still unclear about what it wants to do, British Members of Parliament were presented with eight options today, some of which they had already refused in the past, some of which were new, some of which remained vague. Prime Minister May had been complaining that Parliament keeps telling her what it doesn’t want, but cannot agree on what it does want. Among eight options, one would hope, at least one could garner a majority. So what will happen next? Chaos and mayhem, even more of it. But, respected loyal subjects of the Crown, you must not despair, for Parliament did find time — on the same day! 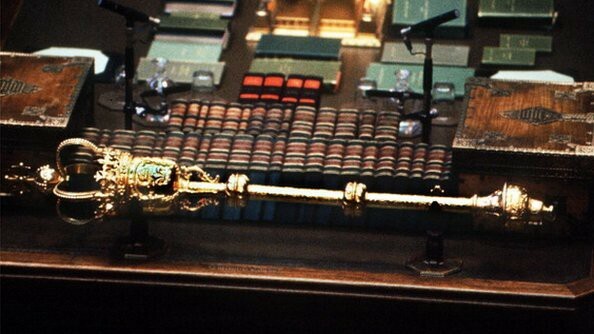 — to discuss such pressing matters as the Queen in Parliament, the Civil War of 1648 and the sovereignty of the mace. The mentioned mace, for the illumination of readers not versed in arcane political symbols, is a silver-gilt ornamental club and a symbol of royal authority. Without it, Parliament cannot meet, debate or pass laws. So, if you want to bring British parliamentary democracy to a standstill, you simply pick up the mace and walk out of the Palace of Westminster. As the monarch has no real executive or legislative powers according to the constitution, which, by the way, nobody can seem to find and nobody has ever seen, the Queen would be rendered ineffective too. But surely, that would never happen, would it? Well, last December, a Member of Parliament tried. The end of the political system as we know it was only averted because a lady with a sword stopped him. And what country wouldn’t have ladies with swords in their parliament in the 21st century? Fun fact 1: If the right honourable member for Brighton Kemptown had managed to get to the nearest church with the mace unscathed and found a bishop to perform the necessary ceremony, he could have become king. But only if he is not Catholic. Fun fact 2: One argument of Brexiters against the European Union was that it was, allegedly, an undemocratic body with opaque rules. Another example of everyday objects being mythologically supercharged in Great Britain is the Stone of Scone.